The Flame Angel is a stunning dwarf Angel that is bright red in color with black vertical bands on each side of its body. This fish is undoubtedly the most popular and well known of all dwarf Angels. These fish do very well in aquariums and prefer lots of rockwork to feel comfortable. The Flame Angel should be kept in a tank of 50 gallons or larger, so it'll have ample room to roam. They will spend most of their day grazing algae that grows on live rock. They should not be kept with other dwarf Angels. The flame angel is argumentatively one of the most beautiful of the dwarf angel species. Thankfully this fish is also one of the most hearty of the dwarf angels. The flame angel is bright red with a orange/yellow base to its body. It has a few black vertical stripes with some purple at the ends of the top and bottom caudal fins. Flame Angelfish has a distinctive dark orange body with vertical black stripes on its sides. 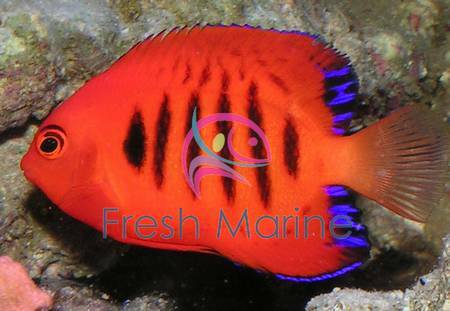 Flame�s beautiful coloring and markings makes it a colorful addition to any aquarium system. While not technically reef safe, many hobbyists report success keeping this fish in the miniature reef aquariums without adverse consequences to the other inhabitants of the aquarium. The Flame Angelfish will feed on most types of food offered to it, including flake food. This relatively small Angelfish is not particularly aggressive, however it is territorial with other Flame Angels. For this reason only one should be kept per aquarium. It requires the minimum of a 40-gallon tank with lots of hiding places and live rock for grazing. Flame angelfish is hermaphroditic, very difficult to breed in an aquarium, and has no distinguishable differences in color between male to female. The dwarf Flame angelfish will come generally 2 to 4 inches .However the Flame angels grows up to 4 inches. Keep water quality high (SG 1.020 - 1.025, pH 8.1 - 8.4, Temp. 72 - 78� F). Specific Care Information: Dwarf Flames Angelfish are generally peaceful fish but will often quarrel with members of their own species and even genus if they look similar enough. Though there are reports generalizing this species are 'reef safe', it is strongly advised to add them to a reef with extreme caution. The reason for this is that many of Flame species will behave like model citizens for a while, but one day will go after corals and clams for no reason. This may have something to do with the Dwarf Flame Angelfish being predominately plankton eaters as juveniles. An underfed adult may attempt to try something new and find that clams and corals are it's newest favorite diet. It is recommend purchasing the youngest specimen available in hopes it settles down and learns to eat a captive diet prior to learning that corals and clams are a tasty treat. It is important to provide Dwarf Flame Angelfish with plenty of good quality cured live rock and a well aquascaped aquarium with caves, archways and overhangs to swim through or hide in. Especially if there will be more than one Dwarf Flame Angelfish in the same aquarium. Members of the Centropyge genus are referred to as Dwarf Angelfish because of their smaller size in relation to their larger Chaetodontoplus, Genicanthus, Holacanthus and Pomacanthus cousins. Keep water quality high (SG 1.020 - 1.025, pH 8.1 - 8.4, Temp. 72 - 78� F). Diet: In the wild the Flame angelfish has a varied diet consisting of algae and crustaceans. The Flame angel is not considered reef safe as it may nip at large polyped stony corals, soft corals, zoanthids and clam mantles. There are occasional specimens that live very long lives in reef aquaria as peaceful citizens but the majority of these fish will often turn for no apparent reason when they are older. This may be easily explained as many of the Centropyge family are predominately plankton eaters as juveniles and will switch to consuming it�s natural adult diet once fully grown. Sometimes all it takes is for an underfed individual to �test� a food source. This being the case, be sure to add this specimen to a well established tank and feed frozen mysis shrimp, meaty crustaceans such as shrimp and clam. Be sure to include algae such as spirulina.